These terms tell you the rules for using our website www.speedyservices.com and any sub-domains (together, our "Site"). Any reference to "we" or "us" or "Speedy" means Speedy Asset Services Limited, which is a private limited company with registered company number 06847930. Our registered office address is Chase House, 16 The Parks, Newton-Le-Willows, Merseyside WA12 0JQ. 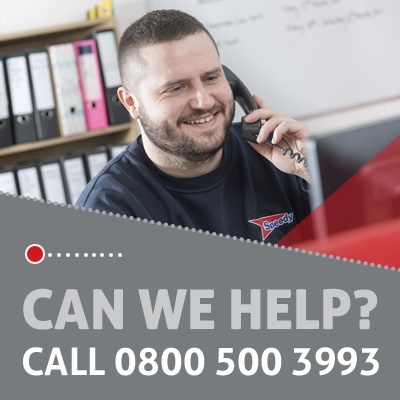 To contact us, please email Customer Services at customerservices@speedyservices.com or write to Chase House, 16 The Parks, Newton-Le-Willows, Merseyside WA12 0JQ addressing your query, in each case, for the attention of the Data Manager. We may amend these terms from time to time to reflect changes in Speedy’s business, applicable law or for other reasons deemed necessary by us. Every time you wish to use our Site, please check these terms to ensure you understand the terms that apply at that time. If these terms change, we will provide notice, which may include, but is not limited to notice provided through the Site or a Speedy user account. We do not guarantee that our Site, or any content on it, will always be available or be uninterrupted. We may suspend or withdraw or restrict the availability of all or any part of our Site for business and operational reasons or in the event you are in material breach of these terms. Where you are in breach of these terms, we may at our sole discretion, suspend or terminate your account or user identification and delete your content from the Site. We may also refuse you any current or future use of the Site without notice. Speedy shall not be liable to you or any third party for any such suspension or termination. If you choose, or you are provided with, a user identification code, password or any other piece of information as part of our security procedures (for example, in relation to your MySpeedy account), you must treat such information as confidential. If you know or suspect that anyone other than you and authorised additional account users knows your user identification code or password, you must promptly notify us at customerservices@speedyservices.com. We are the owner or the licensee of all intellectual property rights in our Site, and in the material published on it. Those works are protected by copyright laws and treaties around the world. All such rights are reserved. Nothing in these terms shall be deemed to give you the right to modify, distribute, copy transmit, reproduce, display, publish, license, create derivative works from, transfer, or sell the Site or content for any reason, unless otherwise expressly permitted by these terms or the law. You hereby agree to assign any modifications or derivative works of the Site and content made by you in contravention of this limitation without remuneration of any kind. Although we make reasonable efforts to update the information on our Site, we make no representations, warranties or guarantees, whether express or implied, that (i) the content on our Site is accurate, complete or up to date; (ii) the Site shall have any features or qualities; or (iii) give any undertaking with regard to any other quality. Statements and explanations on the Site in promotional material or documentation are made for explanatory purposes only, they are not meant to constitute any guarantee or warranty of certain features. This Site may include information and materials uploaded by other users of the Site, including to bulletin boards and chat rooms. This information and these materials have not been verified or approved by us. The views expressed by other users on our Site do not represent our views or values. We will not be liable or responsible in any way for any user generated content posted on or linked from the Site, including, but not limited to, any omissions or errors within the content, or for any losses or damage of any kind incurred as a result of the use of or reliance on any content or other material accessed on or via the Site and made available from a third party. statements, messages, or conduct of any third party on the Site. Please note that we only provide our Site for your domestic and private use. You agree not to use our Site for any commercial or business purposes, and we have no liability to you for any loss of profit, loss of business, business interruption, or loss of business opportunity. Whenever you make use of a feature that allows you to upload content to our Site or, if relevant, to make contact with other users of our Site, you must comply with the Acceptable Use Terms below. Any content you upload to our Site will be considered non-confidential and non-proprietary. You retain all of your ownership rights in your content, but you grant us a perpetual, irrevocable (subject to relevant data protection legislation and our Privacy Notice), non-exclusive, world-wide, fully-paid up and royalty free licence to use such content without restrictions of any kind and without any charge or other consideration of any kind, or permission or notification, to you or any third party. This licence includes (subject to relevant data protection legislation and our Privacy Notice) a right to prepare derivative works, reproduce, combine with other works, alter, translate, distribute copies, display, perform, licence and provide the content to others. Further, you represent and warrant to us that you have the right, title, and authority to grant such licence to us. We have the right to remove any posting you make on our Site if, in our opinion, your post does not comply with our Content Standards, set out below. The website in which you are linking must comply in all respects with the Content Standards set out below. bulletin boards, (together, “Interactive Services”). We will do our best to assess any possible risks for users from third parties when they use any Interactive Service provided on our Site, and we will decide in each case whether it is appropriate to use moderation of the relevant service (including what kind of moderation to use) in the light of those risks. However, we are under no obligation to oversee, monitor or moderate any Interactive Services we provide on our Site, and we expressly exclude our liability for any loss or damage arising from the use of any Interactive Services by a user in contravention of our Content Standards, whether the service is moderated or not. These Content Standards apply to any and all material which you contribute to our Site (“Contribution”), and to any interactive services associated with it. We will determine, in our discretion, whether a Contribution breaches the Content Standards. When we consider that a breach of the Acceptable Use Terms has occurred, we may take such action as we deem appropriate. We exclude our liability for all action we may take in response to breaches of the Acceptable Use Terms. The actions we may take are not limited to those described above, and we may take any other action we reasonably deem appropriate. Our Site is intended for those who access it from within the United Kingdom. Because of this we cannot guarantee that the Site or the content thereon complies with laws or regulations, or is appropriate for use, in other places. "Speedy" is a UK registered trade mark of Speedy Hire plc. You are not permitted to use it without our approval, unless it is part of material you are using as permitted under How you may use material on our Site. The content of these pages is protected by copyright © Speedy Hire PLC 2018.